atmosphere. It has been observed that sonication for 4 hours, effectively exfoliates graphite to form Graphene sheets. the Sonopolymerization of the solvent (ortho-dichloro benzene) and graphite-solvent interaction. pactly packed into a two-dimensional honeycomb lattice. ple codes with sonication time are shown in the Table 1.
not sufficient to get colloidal dispersion of Graphene. 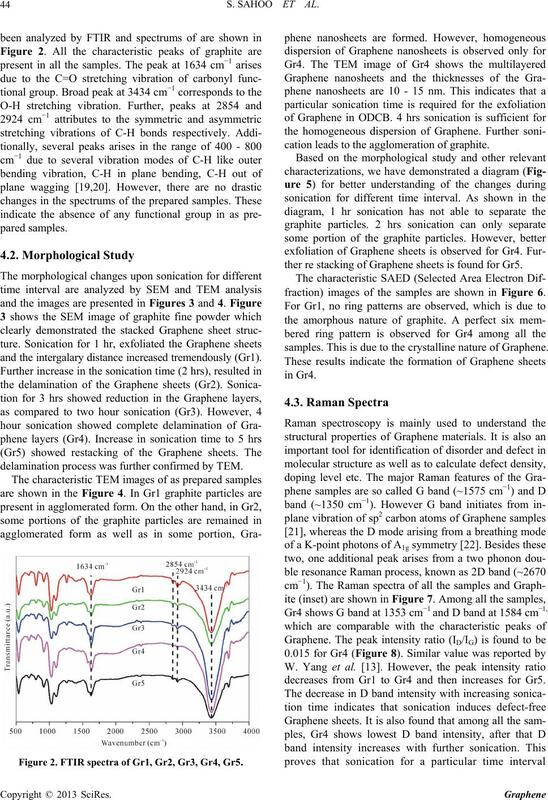 of Graphene can be achieved after 4 hrs sonication. Figure 1. Vial images (before and after one month). analyzed for getting the spectrum. by using Tescan VEGA LSU SEM. and the intergalary distance increased tremendously (Gr1). delamination process was further confirmed by TEM. Figure 2. FTIR spectra of Gr1, Gr2, Gr3, Gr4, Gr5. cation leads to the agglomeration of graphite. 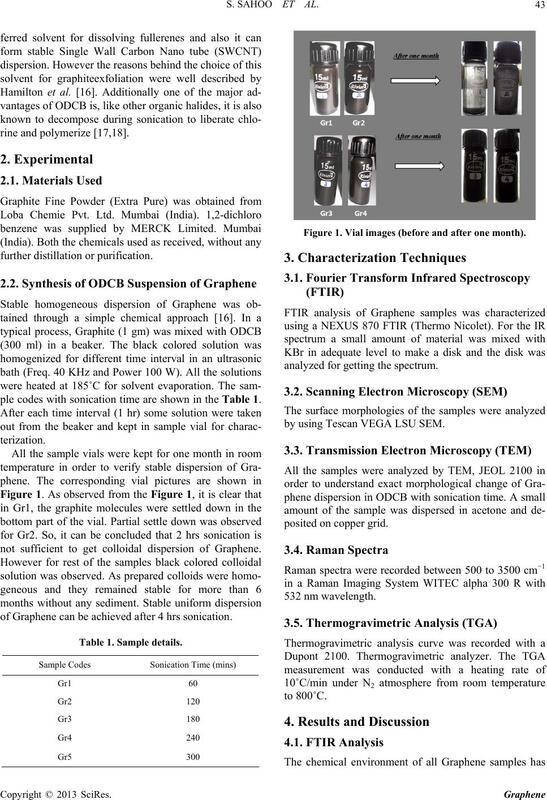 ther re stacking of Graphene sheets is found for Gr5. fraction) images of the samples are shown in Figure 6.
samples. This is due to the crystalline nature of Graphene. decreases from Gr1 to Gr4 and then increases for Gr5. Figure 3. 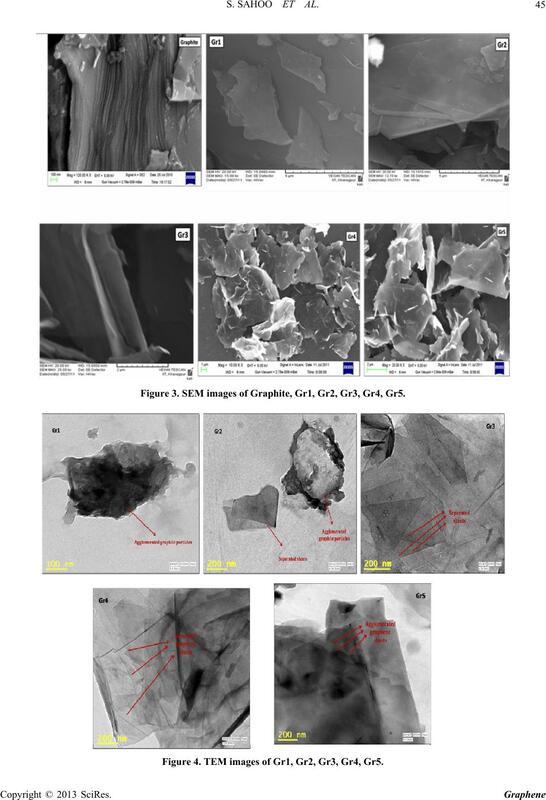 SEM images of Graphite, Gr1, Gr2, Gr3, Gr4, Gr5. Figure 4. TEM images of Gr1, Gr2, Gr3, Gr4, Gr5. Figure 6. SAED images of Gr1, Gr2, Gr3, Gr4, Gr5. efficiently exfoliates graphite without initiating defects. 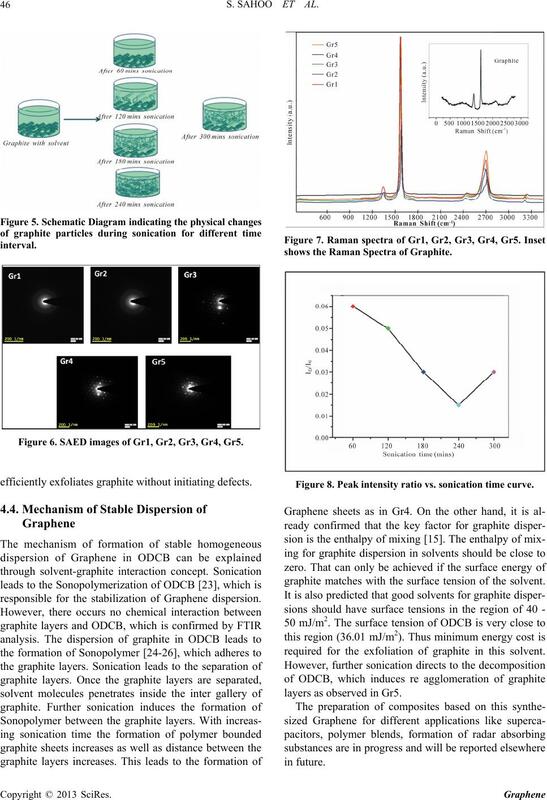 responsible for the stabilization of Graphene dispersion. shows the Raman Spectr a of Gr aphite. Figure 8. Peak intensity ratio vs. sonication time curve. graphite matches with the surface tension of the solvent. required for the exfoliation of graphite in this solvent. layers as observed in Gr5. Figure 9. TGA curve of Gr4. 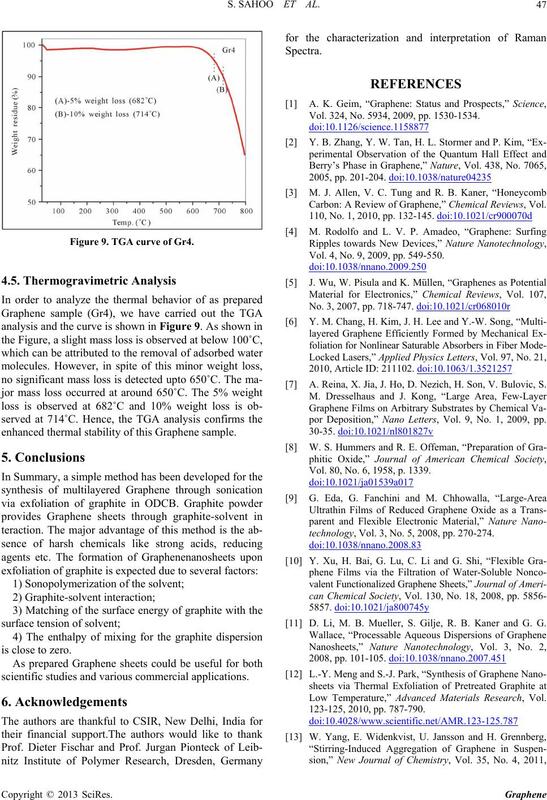 enhanced thermal stability of this Graphene sample. scientific studies and various commercial applications. Vol. 324, No. 5934, 2009, pp. 1530-1534. 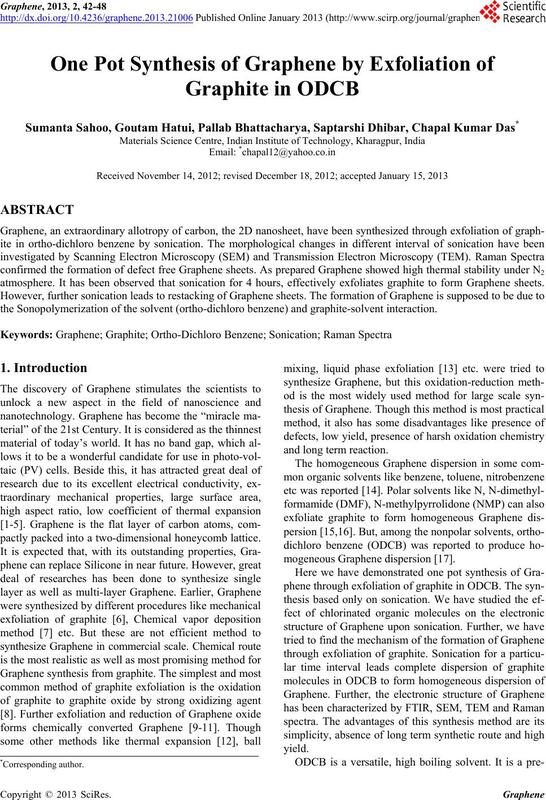 Carbon: A Review of Graphene,” Chemical Reviews, Vol. Vol. 4, No. 9, 2009, pp. 549-550. 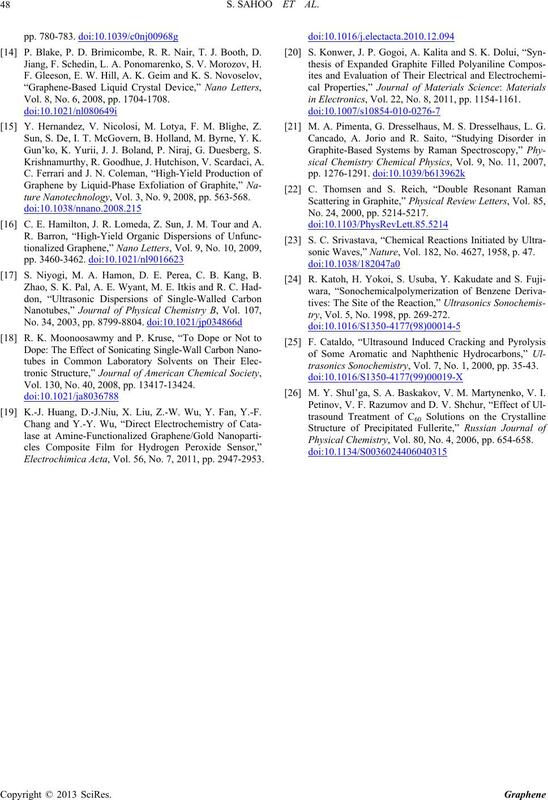 A. Reina, X. Jia, J. Ho, D. Nezich, H. Son, V. Bulovic, S.
por Deposition,” Nano Letters, Vol. 9, No. 1, 2009, pp. Vol. 80, No. 6, 1958, p. 1339.
technology, Vol. 3, No. 5, 2008, pp. 270-274. D. Li, M. B. Mueller, S. Gilje, R. B. Kaner and G. G.
Low Temperature,” Advanced Materials Research, Vol. P. Blake, P. D. Brimicombe, R. R. Nair, T. J. Booth, D.
Jiang, F. Schedin, L. A. Ponomarenko, S. V. Morozov, H.
Vol. 8, No. 6, 2008, pp. 1704-1708. Y. Hernandez, V. Nicolosi, M. Lotya, F. M. Blighe, Z. Sun, S. De, I. T. McGovern, B. Holland, M. Byrne, Y. K.
Gun’ko, K. Yurii, J. J. Boland, P. Niraj, G. Duesberg, S.
Krishnamurthy, R. Goodhue, J. Hutchison, V. Scardaci, A.
ture Nanotechnology, Vol. 3, No. 9, 2008, pp. 563-568. C. E. Hamilton, J. R. Lomeda, Z. Sun, J. M. Tour and A.
 S. Niyogi, M. A. Hamon, D. E. Perea, C. B. Kang, B.
Vol. 130, No. 40, 2008, pp. 13417-13424. K.-J. Huang, D.-J.Niu, X. Liu, Z.-W. Wu, Y. Fan, Y.-F.
Electrochimica Acta, Vol. 56, No. 7, 2011, pp. 2947-2953.
in Electronics, Vol. 22, No. 8, 2011, pp. 1154-1161. M. A. Pimenta, G. Dresselhaus, M. S. Dresselhaus, L. G.
No. 24, 2000, pp. 5214-5217.
sonic Waves,” Nature, Vol. 182, No. 4627, 1958, p. 47.
try, Vol. 5, No. 1998, pp. 269-272.
trasonics Sonochemistry, Vol. 7, No. 1, 2000, pp. 35-43. M. Y. Shul’ga, S. A. Baskakov, V. M. Martynenko, V. I. Physical Chemistry, Vol. 80, No. 4, 2006, pp. 654-658.